Subtraction Smash is a fun game which helps students learn the concept of subtraction. 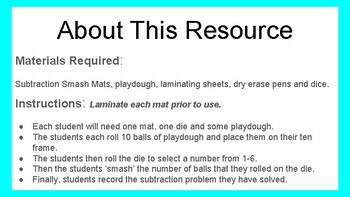 Subtraction Smash Mats, play dough, laminating sheets, dry erase pens and dice. Instructions: Laminate one mat per student prior to use. Each student will need one mat, one die and some play dough. The students each roll 10 balls of play dough and place them on their ten frame. The students then roll the die to select a number from 1-6. Then the students ‘smash’ the number of balls that they rolled on the die. Finally, students record the subtraction problem they have solved.